For just the second time in Conference history, Kansas State has produced the Preseason Big 12 Player of the Year as senior forward Dean Wade captured the award. Kansas’ Dedric Lawson picked up Newcomer of the Year while teammate Quentin Grimes was selected Freshman of the Year in the 2018-19 Preseason All-Big 12 honors, chosen by league head coaches. Wade also was the only unanimous selection on the Preseason All-Big 12 Team. He has played in 101 career games at K-State and started 98. Wade had participated in every game in his career until missing most of the last five games due to injury. The 6-10 forward was selected to the All-Big 12 First Team at the conclusion of last season after averaging 16.2 points and 6.2 rebounds while shooting 55 percent (198-of-360) from the field. Junior transfer Lawson will be eligible after sitting out last season due to NCAA transfer rules. As a sophomore in 2016-17, he averaged 19.2 points and 9.9 rebounds. The 6-9 forward was also voted onto the Preseason All-Big 12 Team. Grimes was the Texas state player of the year as a senior at College Park High School and picked up numerous All-America honors. The 6-5 guard earned Most Valuable Player and All-Tournament selection at the 2018 FIBA Americas U18 World Championships in leading the USA to the gold medal under the direction of KU coach Bill Self. 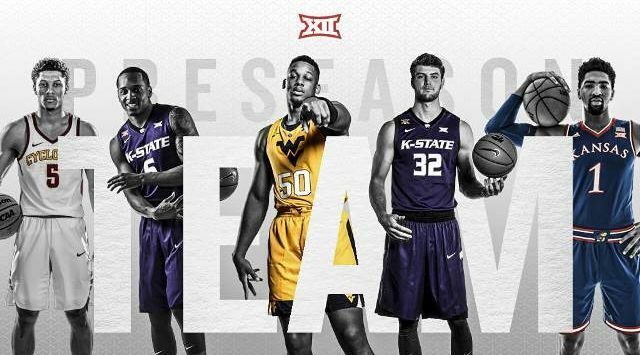 Joining Wade and Lawson on the Preseason All-Big 12 Team are Lindell Wigginton (Iowa State), Barry Brown, Jr. (K-State) and Sagaba Konate (West Virginia). Wade is the only 2017-18 All-Big 12 First Team selection returning to the Conference this season. Brown was an All-Big 12 Second Team pick last year while Konate was selected to the third team and Wigginton was honorable mention. The preseason team consists of two seniors, two juniors and a sophomore after being comprised of all seniors in 2017-18. The Big 12 will tip off the 2018-19 campaign with its annual media day, slated for Wednesday, October 24 at Sprint Center in Kansas City. The preseason poll will be announced on October 18.